15 to 20% of Americans have some sort of allergic reaction to dogs. Despite the prevalence of dog-related asthma, sneezing, itchy skin and hives, nearly half of US households have at least one pup. Pet lovers are clearly willing to endure their symptoms in order to enjoy the many benefits of sharing their lives with dogs. Luckily, there are several things these pawrents can do to help control their dog allergies. According to the Mayo Clinic, allergies occur when the immune system reacts to an allergy-triggering substance. For example, when a person with dog allergies encounters a pup, their body reacts to proteins in the hair and skin cells (dander). The immune system goes into defense mode, causing inflammation of the skin, sinuses, airways or digestive system. The severity of the allergic reaction varies from person to person and can change throughout an individual’s life. Some may get an itchy rash while others suffer sinus pressure and sneezing. In rare cases, life-threatening asthma or deadly anaphylaxis can occur. Before you blame your symptoms on your pup, see your doctor for allergy testing. You may find you are reacting to your dog’s shampoo or pollen on his fur, not the dog himself! Studies have shown only one in five owners are willing to give up their pups due to allergies – even when their doctors recommend it. If allergy testing shows you are indeed allergic to your dog, there are several ways you can help minimize your symptoms and keep your pup! 1. Create an “Allergy-Free” Zone in Your Home. The dander that causes dog allergies has a way of sticking to clothes, bedding, curtains and carpets. If possible, folks with allergies should restrict their dogs’ access to the bedroom. 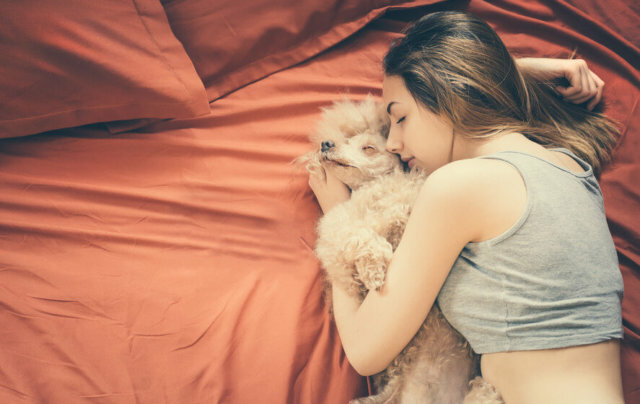 It may seem sad to give up nightly cuddles with your pup, but it’s better than having to give him up for good! Those with strong allergies should also invest in high-efficiency HEPA air cleaners to make sure dander from around the house does not drift into their “allergy-free” zone. As mentioned above, allergens have a knack for sticking to soft surfaces. Removing carpeting in favor of hardwood, tile or laminate flooring will help minimize buildup. Drapes and curtains should also be replaced with shutters or blinds. When it comes to furniture, synthetic leather is a better choice than fabric. If you cannot replace your carpets, be sure to have them deep-cleaned at least twice a year. Frequent cleaning and vacuuming prevents allergens from building up in the nooks and crannies of your home. Wipe down all surfaces where dust may accumulate, including fan blades and shelves. 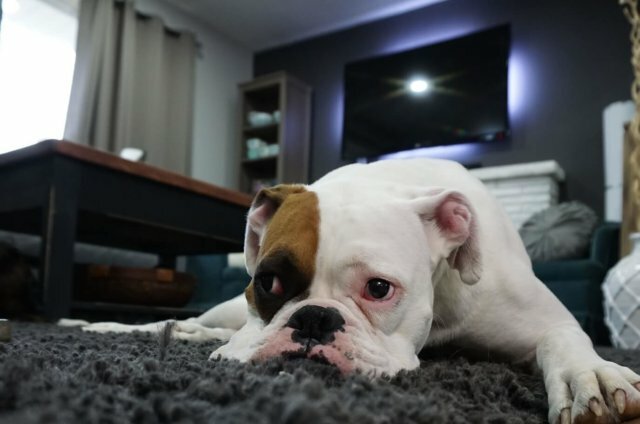 Change air filters regularly – perhaps even more often than monthly – and wear a mask when dusting and cleaning, as these activities are likely to trigger your dog allergies. Be sure to choose a vacuum cleaner with a HEPA filter. They remove up to 99.97% of tiny, allergy-inducing particles. It is also important to ensure your vacuum is functioning properly. If not tightly sealed, allergens may bypass the filter and be redistributed back into the air. After vacuuming, empty the canister outside to prevent particles from spreading back into your home. 4. Wash Your Dog’s Bedding Weekly. 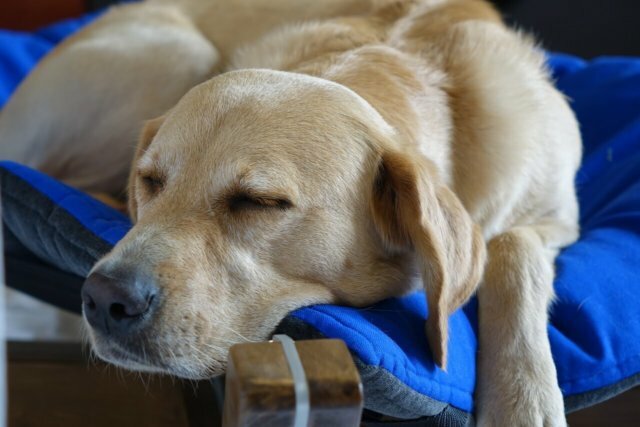 Dogs spend most of their time sleeping or lounging, so it is no wonder their bedding is a magnet for hair and dander. Frequent washings with specially formulated laundry detergent will help remove allergens. 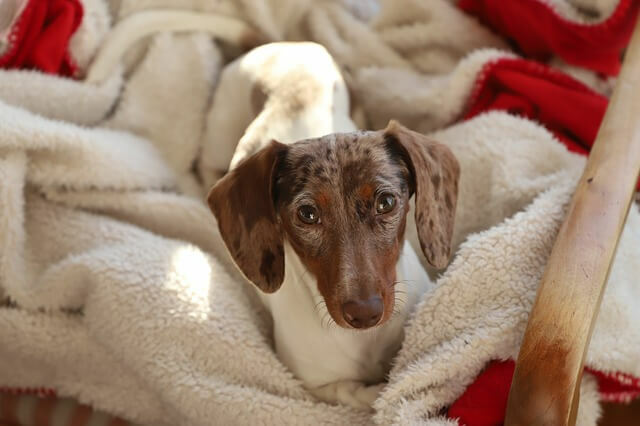 If your pup’s bed is awkward to wash, try covering it with blankets or sheets to catch the dander. These items can be easily tossed into the wash and replaced. 5. Keep Your Dog Well-Groomed. Many people with dog allergies seek out “hypoallergenic” breeds. While no dog is entirely allergen-free, smaller, low-shedding breeds tend to cause less symptoms. However, low-shedding dogs have constantly-growing hair coats that require frequent grooming. Talk to your groomer about choosing a short, neat haircut. Sometimes referred to as a “puppy cut,” this style will reduce the number of allergens that accumulate on the hair coat. While your groomer will bathe your dog at the time of his haircut, you may also want to give extra baths at home. Frequent bathing removes dead skin cells and can reduce allergens by as much as 84%. Just keep in mind that over-bathing can be harmful to your pup’s delicate skin. Ask your vet to recommend a shampoo and help you come up with a bathing schedule. Grooming wipes are another choice when a full bath is not an option. They are gentle, fresh-smelling and help swab away allergens on your dog’s coat and paws after trips outside. Frquent brushing also helps remove dead hair and dander that may otherwise trigger your dog allergies. As an added bonus, it is great for your pup’s skin and coat. 6. Make Sure Your Pup is Potty Trained. Potty training is one of the basics of dog ownership, but did you know it can also help reduce your allergies? In addition to dander, dogs release allergens through their urine. The particles stick around long after the pee has dried and easily spread throughout the air. For help potty training your stubborn pup, check out this post. 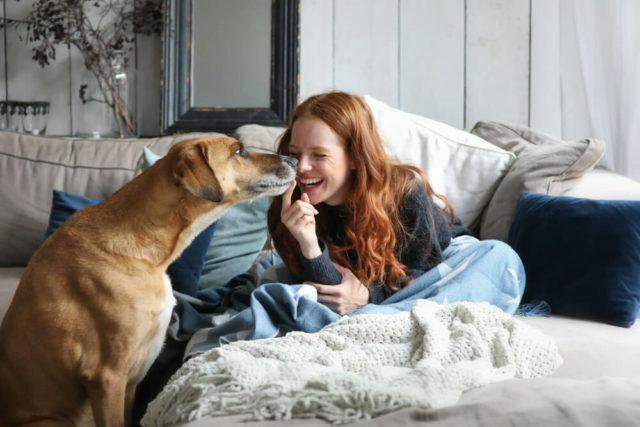 This one may seem like a no-brainer, but being a pet parent with dog allergies does not necessarily mean you have to spend your life in a Benadryl fog. New allergy treatments are emerging all the time, so work with your doctor to find the right combination of medications and holistic options that work for you. Just be sure your allergist understands you are commited to keeping your dog. Antihistamines, inhalers, decongestants, steroid-based treatments and immunotherapy (allergy shots) can all be quite effective depending on the patient. Vitamins like E, C, A, and B6, as well as oils containing omega-3 fatty acids may also help bolster your system to defend against your dog allergies. Devoting yourself to these small changes can make a world of difference when it comes to living with dog allergies. As you already know, your pup is worth it! 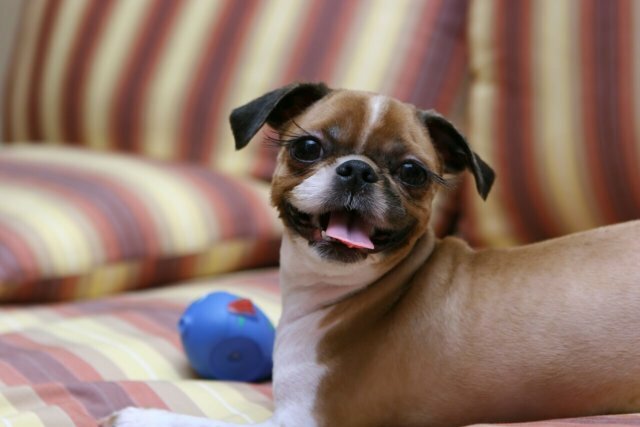 The post 7 Ways Pet Parents Can Help Control Their Dog Allergies appeared first on iHeartDogs.com.